Judge Dredd is a grittier echo of Demolition Man. The film distances itself quite a bit from the 2000 A.D. comic book character from which it was inspired, so any mention of it would be irrelevant here. 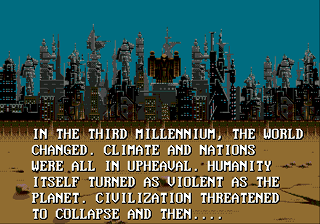 The Judge Dredd film is about a future in which the world is mostly a barren wasteland. Crime in the few remaining civilized parts of the world has become overwhelming. Thus, a new era of law enforcement begins. 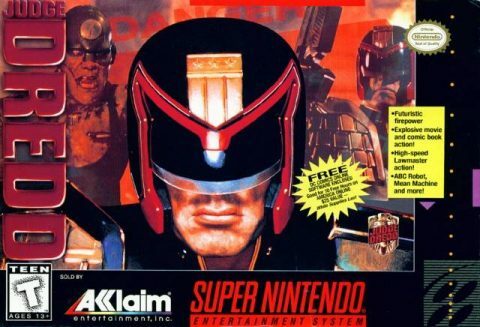 A council is formed, and this council dispatches a new breed of super soldiers called Judges, who are capable of dispensing law and sentencing at the scene of the crime. As the movie states, the Judges are all at once judge, jury and executioner. 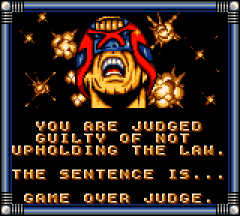 Unfortunately, our “hero”, Dredd, falls victim to the very system he upholds. A murder is carried out using his gun, and the DNA signatures taken from the gun match Dredd’s. 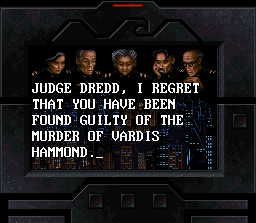 Spared death, Dredd is sentenced to life imprisonment at Aspen Penal Colony. En route, however, Dredd’s carrier is attacked by a group of rogues who call the Cursed Earth (the area outside Dredd’s city) home. 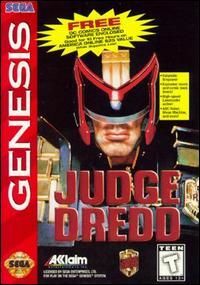 Stranded in the wilderness, Dredd must get back into the city and find a way to prove his innocence, and in the process, he’ll uncover the corruption within the Judge Council and a conspiracy involving cloning. 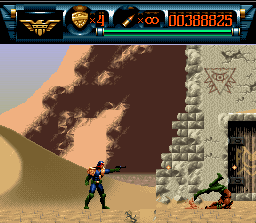 The Judge Dredd movie game was also released by Acclaim, this time developed by their Probe Software (and is one of the only decent games developed by them). 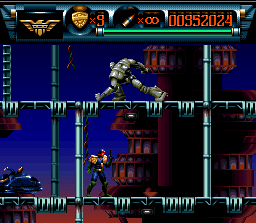 Unlike its predecessor, Judge Dredd was released on a slew of consoles simultaneously. 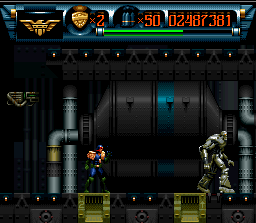 Also unlike its predecessor, the SNES version of the game is by far the definitive version with all others paling in comparison. Judge Dredd at first looks similar to Demolition Man. 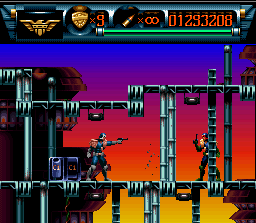 The basic premise of the games are the same (run ‘n’ gun your way through sidescrolling stages). 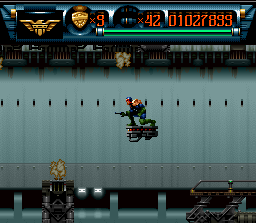 However, Judge Dredd is much more focused. 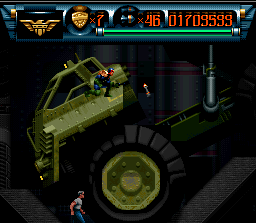 The game discards the mindless carnage that most licensed games of its ilk adhere to in favor of missions. Every set of stages has a set of objectives, usually an obligatory one and an optional one. 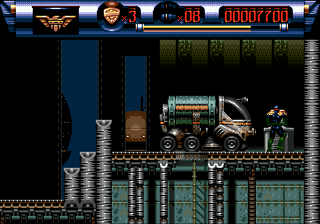 For instance, in the first set of stages, you need to quell a series of riots by destroying shipments of weapons. 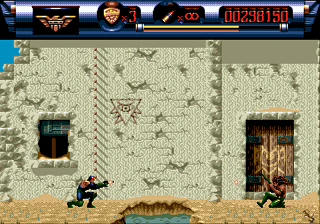 The secondary objective almost always involves arresting or killing all the enemies in the stage. The game tends to favor that you arrest whoever you can rather than kill them. This can be more complicated than it sounds, as each enemy has a different method in which you need to get them to surrender (if it’s even possible). 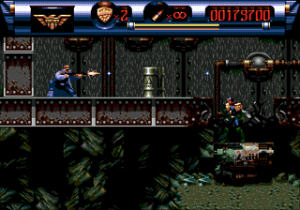 This can involve using a particular type of ammo, using physical attacks instead of guns, or causing a specific amount of damage without killing the target. 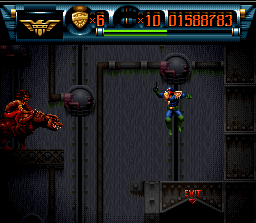 Once you’ve made the enemy surrender, you’ll have to walk up to them and press the appropriate button to make the arrest, and you’re given a short duration of time to do this before they go back to fighting. Upon arresting someone, they’ll be shipped off, more often than not after dropping ammo or items. Thus, arresting people is much more rewarding than killing everyone in sight, and there’s still plenty of enemies who can’t be arrested to quench your bloodlust. 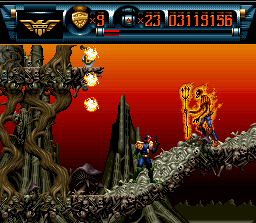 Fulfilling your missions completely also nets you bonus lives, which in this game function as extra life bars (if you die, Dredd merely gets back up on the spot). The means given to Dredd to carry out his mission are a major part of what makes this such a fantastic game. 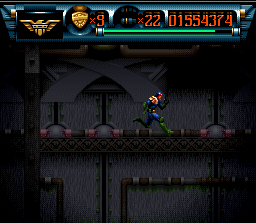 For the platforming segments, Dredd is easy to control, you have a lot of air time, and you can give yourself a huge boost by running before you leap. You’re given a wide array of ammo, from simple grenades to bullets that bounce off walls and special shots dedicated to capturing the souls of the Dark Judges who possess certain enemies throughout the game. 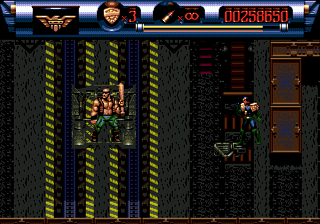 In the SNES version, Dredd also has a few physical attacks, capable of kicking, punching, uppercuts and headbutts. You can also crawl along the ground out of a crouching position and later on, you can even fly temporarily with certain items on hand. But the real star of the show is the stage design. The stages tend to start off fairly linear and then break off into branching paths. Completing a mission usually means that you’ll have to explore every nook and cranny of a stage, but at the very least, you can choose which way to go first. The stages are also pretty dynamic (though not quite as much as those in Demolition Man), with lots of multi-tiered platforming, climbing and other forms of navigating terrain. 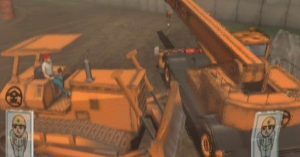 In one stage, you’ll climb on giant trucks and negotiate a series of conveyor belts to survive a factory flooded with toxic chemicals. In another, you’ll have to navigate a maddeningly complex series of elevator tubes. 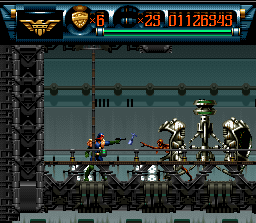 There’s even a simplistic rail shooter stage thrown in at random (probably just to feature the much advertised Lawmaster) for a little variety. 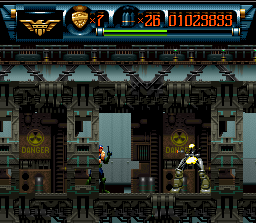 There’s also tons of secret areas strewn about the stages, some involving you pushing boxes around to reach higher ground, walking through suspicious-looking walls, and destroying well-hidden computer terminals to deactivate laser fields. 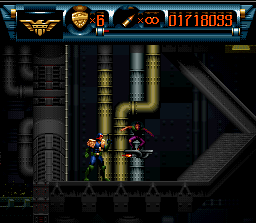 Judge Dredd‘s only major flaw is the boss fights. 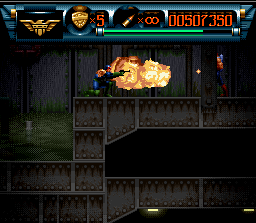 The actions of the bosses are too eclectic to develop any real strategy, so they essentially boil down to a shootout where whoever causes the most damage the fastest wins. 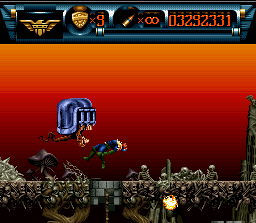 Add this to the aforementioned fact that you revive in the same spot you die in so long as you have extra lives and you have a recipe for some dull boss battles. 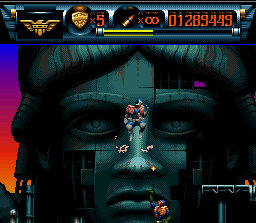 Judge Dredd looks pretty slick and is quite a bit more visually impressive than Demolition Man. 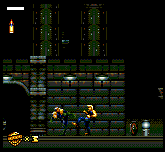 The sprite animation is amazing, particularly Dredd, whose movements are every bit as smooth as those in Prince of Persia even though they weren’t rotoscoped. The backgrounds are very nicely detailed and almost always contain some type of activity, be it rain, cascading sewage or the constantly churning mechanisms of a factory. 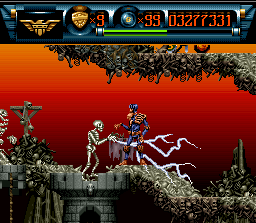 Particularly awesome is that you get to go places that only exist in the comic book, like the nightmarish Dead World where Judge Death awaits you at the end of the game, a horrific necropolis made of bone within a lake of magma, which when compared to the other locales of the game, is an unexpectedly eldritch environment. Judge Dredd was released on all the major cartridge-driven consoles. 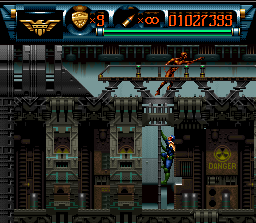 As mentioned above, the SNES version is the definitive version. 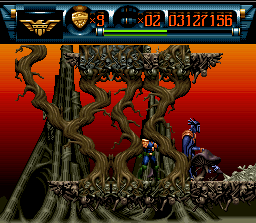 The Genesis version at first looks identical (marginal visual and audio hardware degradation aside), but once you get into it, it becomes obvious that it’s a sloppy port. 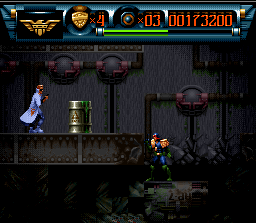 First off, Dredd can only physically attack while standing still, and you can no longer perform the punch or the headbutt on command, rather, they come out at random when you’re in close to an enemy. 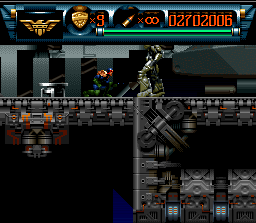 Dredd also seems to have some difficulty crawling on angled surfaces, a problem not present in the SNES version. 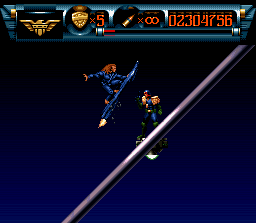 Worse yet, you can’t use the jump kick, which was actually quite useful in the SNES version. These changes are not only annoying, they’re totally unnecessary. 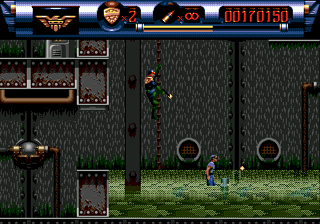 The worst thing about the Genesis version, however, is the jump mechanics. They’re completely different. 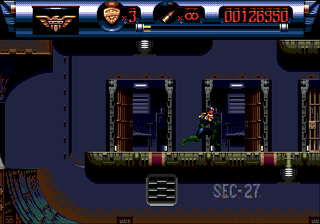 Rather than the extended air time you get in the SNES version, Dredd drops like a stone after his jump peaks here, making some jumps that were a breeze on SNES become pixel-perfect affairs on Genesis. Another annoying and almost game-breaking change is that it’s much harder to arrest criminals. 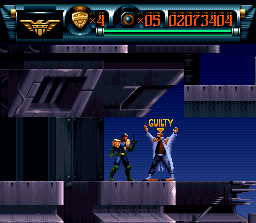 For some reason, you now have to be on top of the criminal’s sprite in order for the arrest button to work. Additionally, the time you have to make the arrest after a perp surrenders is much, much shorter. This meaning A) you can’t shoot enemies that can be arrested from a distance otherwise they’ll be back to fighting before you get to them (bare in mind that if the method of making a perp surrender causes damage, you may only get them to surrender once), thus you’ll be putting yourself in harm’s way more often and B) you’ll be missing out on a lot of extra ammo, health and power ups because you’re going to end up accidentally killing a lot more criminals. Curiously, it seems the development team tried to compensate for this by making ammo more abundant and health power-ups more potent. 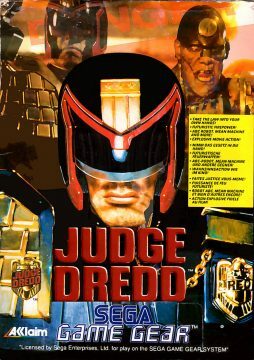 Inexplicably, about a year and a half after the other versions were released, Judge Dredd was released for Windows 95. I’ve never actually played it (and probably never will because it goes for $60 on eBay), but anecdotal information I’ve heard about the game states that it’s pretty much a carbon copy of the SNES game. 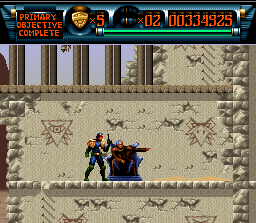 There have also been several other Judge Dredd games throughout the years, including one for the ZX Spectrum and two for the Commodore 64. 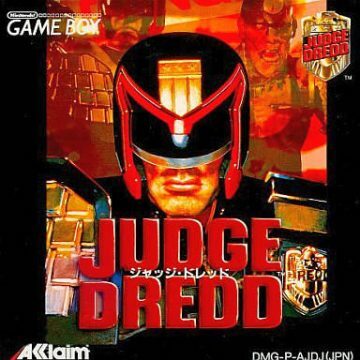 There’s also a light gun game for the PSOne, as well as Judge Dredd: Dredd Vs. Death, a first person shooter for the Playstation 2, Xbox, Gamecube and PC. However, these are all based off the comic book and not the Stallone movie. 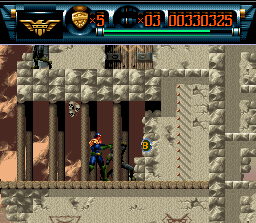 The handheld versions of Dredd are, for the most part, entirely different games built with the tapestry of the console versions in place. First, there’s the Game Gear version, which is actually pretty decent. 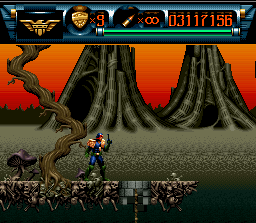 The colors are nice, there’s an adequate amount of detail, and a lot of the sprites made it over without too much deterioration (though Dredd himself looks a bit awkward). 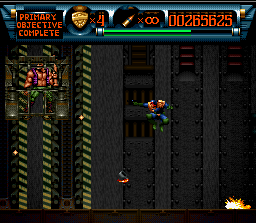 Due to a loss of buttons, Dredd can no longer attack physically on command, rather, he attacks physically automatically when he’s close enough to an enemy. 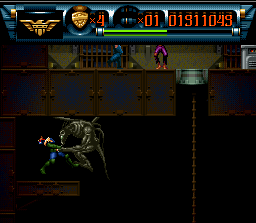 Similarly, Dredd no longer needs a button to arrest surrendered perps: he does so automatically when he walks up to them, but the extremely tight timing of the Genesis version seems to be in place here. 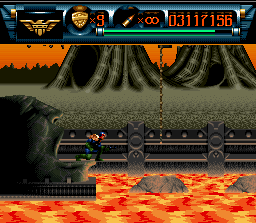 The jump mechanics, thankfully, are ripped from the SNES version. 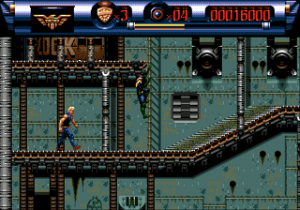 One thing worth noting is that every area of the game consists of three stages, where several areas in the console versions only had two (there some areas, like the second and seventh from the console versions, were condensed into one here and the game overall is shorter, ending with the fight with Rico which was only 2/3rds of the way through on the console versions). And then there’s the Game Boy version, which at first seems like the same game as the Game Gear version, but isn’t quite. It more closely mimics the console games in terms of how many stages there are, with only two stages for the first area, three for the second, and so on (though still condensed like the Game Gear version). Unfortunately, this version doesn’t play as smoothly, and it’s terribly ugly. 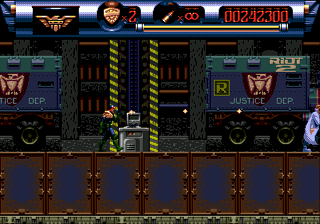 Attempting to rip Dredd’s ultra-detailed sprites from the console versions and convert them to the primitive pea-soup display of the Game Boy didn’t work out too well and they’d have been much better off just redrawing them.